DFW | 5-6-7-8 Dancing My Way to a Healthy Me! One of the things I try very hard to do is to select line dances which match up with a “Couples” dance style. I choose dances where the choreography of the dance is done to distinct types of music which correspond to the couples dance styles: Cha-Cha, East Coast Swing, West Coast Swing, Rumba, Tango, Night Club Two Step, Polka, Salsa, etc. Why? Because finding a place to actually DANCE the line dances that you learn in class is HARD! Of course you can always dance in your kitchen or living room or even on the front porch. The neighbors might talk about that “crazy person” down the block, but you could do it. DanceMakers has two “Practice Parties” each month. In Feb they will be on Feb 10th and Feb 24th, 8pm – 9:30 pm. So….to use this week’s dance as an example, when you’re at the Practice Party, and a “Cha Cha” comes on, you can jump out in the middle of the floor and start doing “Breaking Hearts” the dance that we’ll review/learn on Tue. As you dance, use good dance floor etiquette and be aware of the other dancers on the floor so that everyone can enjoy their style of dance, both couples and line. Use this pattern to practice basic Cha-Cha technique and improve your couples dancing. And… HAVE LOTS OF FUN! Next class is tonight, Jan 31st!!!! UCWDC and ACDA Competition Dance. – Newcomer skill level in the “Cuban” Category. IF you haven’t already snagged this awesome deal…check out the Groupon Special below! IF you haven’t been to class in a while, then this is your personal invitation to come back for a visit! Woot! IF you are a regular, then call up a friend and invite them AND share this speical with them! Woot! One Month of Unlimited Group Classes! — Including the Line Dance Class! Busy-Busy-Busy! A week filled with DANCING! Folks who have read my blog over the years (you know who you are) know that my general theme has been one of rampant goofiness. Well not today… I just don’t have the time or strength or energy. In fact… the past several months have been like that. I’ve been focused so much on DOING that I haven’t had a lot of time to WRITE about doing. I will, try… attempt… endeavor… undertake… give it my best shot to rectify that over the coming couple weeks. Hopefully I’ll be able to bring you up to speed on what’s been happening on the fitness front, the finances front and give you an update as to where I stand on my Journey to Fitness and Health. But, as you may have noticed, I’ve been doing REALLY good to get 1 post out a week about the most pressing topic: my ongoing Line Dance class. So, this post is simply what dancing I’ll be doing this week; I hope you can join me. My “Beginner” line dance class on Tuesday is continuing. I hope you can join me and bring a friend. Really! I need more people in the class! This is summer and as is usual during the summer months, the number of students in the class have dropped off. I really would like more folks in the class! But on the bright side, right now, because of its small size, that means you get lots of individual attention! Woot! 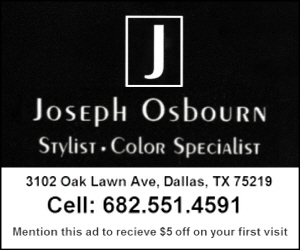 And there is a special price offer this month. Check out the DanceMakers Website for full details. Dances range from Ultra-beginner to Improver; all drawn from the hottest line dances on the planet. Dance: “Fragile” an Advanced level Phrased Line Dance, choreographed by Guyton Mundy, Fred Whitehouse & J.P. Madge. Click on the image for a full size version of the flyer. It is no secret that I love line dance. I also love to compete. It is also no secret that I want MORE people to compete in line dance. So for about a year now I’ve been offering at the VERY low cost of just $20 a special “Intro to Line Competition” session which can be taken in person or via Skype if you don’t live in my area. This workshop on Aug 13th at 2pm will be a Special Presentation in a “group” format at no cost! Well no additional cost. The workshop is included with your weekend and/or day pass. 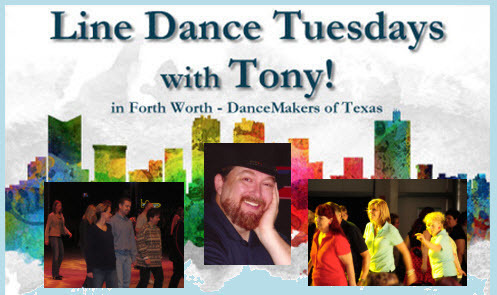 Join UCWDC World Champion and ACDA Nationals Champion “Tony New” to learn everything you need to know about how to use Line Dance as a “drill” to build better basic skills. 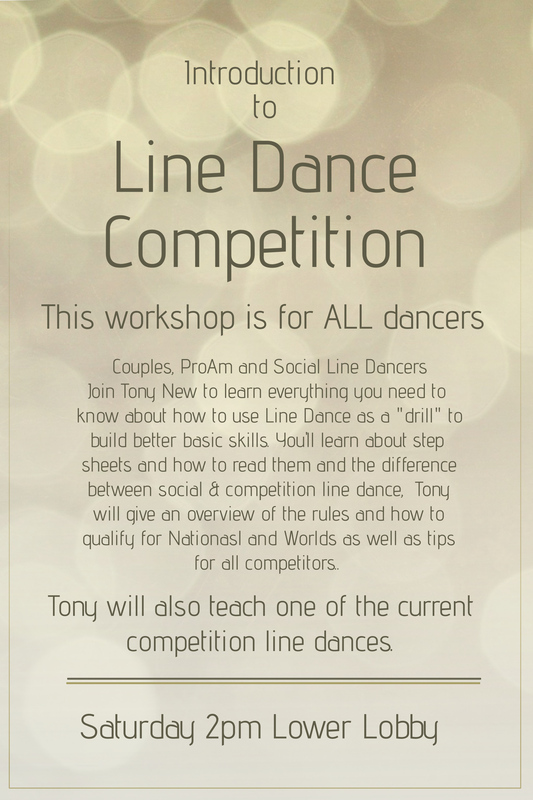 You’ll learn about step sheets and how to read them and the difference between social & competition line dance. Tony will give an overview of the rules and how to qualify for Nationals and Worlds as well as tips for all competitors. Book ahead please! Use this form to contact me about a private lesson. The more in advance you contact me the better I will be able to coach you during the event. Beginning Line Dance Class Starts August 2nd!!!! Every Tuesday at 6:00 pm — NEW CLASS STARTS ON Aug 2, 2016! Dances taught are Ultra-Beginner, Beginner, and Improver level. Dance difficulty level progresses from very easy at the beginning of the month to “Improver” level by month’s end. The class is at its regular time — 6pm! “Midnight Waltz” is the name of the DANCE! It is choreographed by Jo Thompson Szymanski. This dance is a class that has been around for a long time. This is a wonderfully choreographed waltz with lots of fundamental Waltz Steps in the pattern. If you have ever done any COUPLES waltzing, then you will instantly recognize the footwork. Which means that this line dance is an awesome practice tool for GASP couples dancers! So whatcherwaitinfer? Come on out tonight! See ya in class! The music I’ve chosen is the one in this video. It can be done to any speed of waltz. The faster the music, the more difficult it becomes. For tonight (because Tony is worn out from a lot of dancing this past weekend) we are doing it to a slow song! Exercise your mind and your body! Improve your partner dancing! Line dancing is a great way to drill/practice technique! Learn the hottest most popular line dances! Join a worldwide family of dance enthusiasts! Did I mention that line dancing is FUN? Oh? I did…then awesome! Woot! Drop-ins Welcome! 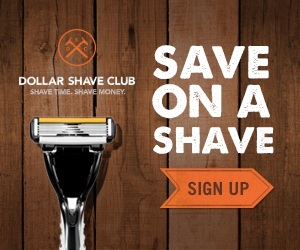 Save money by paying for an entire month of classes. Tonight’s class…a Fun Upbeat Dance for you! July is just rolling along…the class got even bigger last week! Woot! Yay! I really had a great time teaching last weeks class! You guys rock! The fun continues this week. Tonight Tue, July 19th at 6pm! Woot! I’ve got a fun dance lined up for you. It is upbeat and I dare ya not to do a little chair dancing when you hear the music. The dance is called “Move that Groove / choreographed by Tina Argyle.” There are lots of “East Coast Swing” type steps in it so it’s a great dance to practice your East Coast Technique. It is fun. It is easy! And it’s FUN!